Lt. Ira M. Sussky, the 23-year-old operations officer from Little Rock, Ark., leaned against the porch of the tea-plantation bungalow with the other fighter-pilots grouped around him. Over under the trees, the ground crew was warming up a grotesquely painted P-40 and Sussky had to raise his voice to be heard above the roar. "There's a concentration of Jap troops in the jungle 500 yards north of the most northerly bungalow at Supra-bum," he shouted. "We'll hit 10 minutes south of Suprabum, then strike out due north and come up the valley. Get in string, peel off and bomb from east to west. Drop your demolition bomb on the first run and your frags on the next one. Then strafe them twice and head for home." "The Assam Dragon prowls again." Within 10 minutes, a flight of eight fighter-bombers raced down the asphalt runway and took off toward the mountain range in the east that separates India from Burma, the white painted dragon mouths on their noses glistening in the morning sun. We went back to the operations office to await their return and talked with Sgt. Manuel Valerio of Newell, So. Dak., about this bunch of Yank fighter-pilots who have raised so much hell with the Japs in Burma. Hanging on the wall over Sgt. 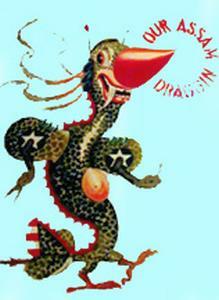 Valerio's head was the Assam Dragon Squadron's battle insignia, designed by Lt. Robert McClung, who was a commercial artist in Denver before the war. It shows a dragon with an ear-to-ear smile. The boys in the squadron say he grins like that only when they feed him generous helpings of his favorite dish -dead Japs. "These guys are driving the Japs nuts," Valerio said. "They run almost daily bombing and strafing missions against the Jap bases and supply routes in northern Burma. Then when the Japs come over here to hit back at them, the Dragons are already up there waiting for them." The last time the Japs came to retaliate, the Dragons did an awful job on them. Forty-six enemy bombers, fighters and observation planes swooped out of the mountains in daylight to hit the U.S. base and only nine were seen returning to Burma. The exact number of enemy losses was hard to determine because the dog fights covered a 3,000-square-mile area, and our searching parties are still hunting for crashed Jap ships in the mountainous jungle land. So far, eight bombers and six fighters have been confirmed and 14 others listed as probables. The total American damage was one bullet hole in the wing of a Dragon ship. After the Japs were beaten off, the Dragons landed for refueling and bombs and took off immediately on a scheduled offensive mission in Burma. 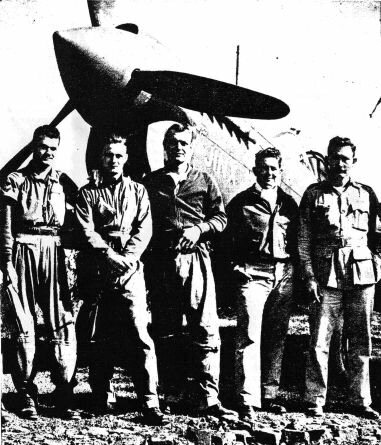 SOME MEMBERS of the Assam Dragon Squadron before they started out on a strafing missing in Burma. The Dragons are always getting mixed up in incredible stunts. 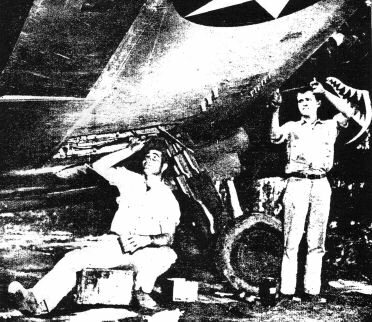 Like the time Lt. Melvin Kimball of Durham, N.H., from Chennault's 14th Air Force, made a belly landing in Burma after his engine conked off during a flight from China to India. Kimball thought he was in India. He walked innocently into the nearest town and right up to the military headquarters. But nobody happened to be around at the moment, not even the CQ. So Kimball headed back to his plane and, as he reached it, soldiers hidden in the surrounding woods opened fire on him. He grabbed his .45 and fired back at them, still thinking he was in India and wondering what the hell all the shooting was about. Just then he noticed bomb craters around him and realized where he was - in the middle of a well-populated Japanese advance base. While Kimball emptied his automatic, an Assam Dragon P-40 appeared overhead. It was Capt. Charles H. Colwell of Park River, No. Dak., coming home from a strafing mission with five bullets in his plane. Colwell dropped down and looked the situation over. Immediately he radioed the Dragon headquarters. "Keep Japs away from grounded plane and pilot until reinforcements arrive," headquarters told him. Four Dragons rushed to the spot and relieved Colwell, who was running out of gas. Then four more came up and joined the party. They took turns diving down on the Jap troops and beating them away from Kimball, who was helpless now with all his ammunition gone. The Japs poured 30 bullets into his plane but luckily they didn't hit him. Meanwhile, back at the Assam Dragon base, Lt. Sussky volunteered to attempt a rescue in a PT-17 trainer. When he arrived at the scene, the other Dragons were still strafing the Japs and keeping them from closing in on Kimball. In the midst of this battle, which looked like Custer's Last Stand, Sussky brought his training ship down safely in a small clearing in the thick jungle, pitted with the mud holes of water buffalo and rutted with elephant tracks. While the Japs still fired on them from ambush, Sussky and Kimball worked frantically to get the PT-17 off the ground. Eight times they tried a take-off and eight times they failed. After every attempt, they ran across the clearing, dodging bullets, and chopped down trees and stumps to make the runway longer. By this time it was beginning to get dark. They knew that if they didn't hoist the ship into the air before dusk they were lost. The P-40s overhead were already having a hard job trying to see the Jap soldiers in the gathering shadows and, when darkness came, it would be easy for the enemy to close in and take them. Finally, on the ninth attempt, the PT-17 arose clumsily into the air and soared away to safety across the tops of the jungle trees. The P-40s escorted her home and then returned and blasted Kimball's plane to bits so the Japs couldn't use it. "Our group A-2 officer here is Lt. Col. Harold Buckley, who used to be a Hollywood script writer," Valerio said. "Somebody asked him if Sussky's rescue stunt wouldn't make a good movie story. The colonel said the public would not believe it. He said they'd say Hollywood was picturing the impossible again." The squadron commander, Maj. Paul C. Droz of Salt Lake City, Utah, has also rescued three U.S. flyers from the Burma jungles. Using a PT-17, he dropped into a box-like canyon and picked up Lt. Cecil Williams and Cpl. Matthew Campanella who had been lost 23 days after parachuting from a plane flying "The Hump." Two weeks later, Maj. Droz did a repeat performance for the benefit of Lt. William A. Wendt who had bailed out near Jap territory en route home from a strafing mission. After lunch, the Dragons flew in from the morning Jap hunt in Burma and Lt. Jack Irwin of Phoenix, Ariz., gave us the score - three direct hits on Jap barracks, which were burning fiercely when the Dragons left, and probably heavy Jap casualties from fragmentary bombs and straflngs. "We really gave them a work-out," Irwin said. "Almost as good as when we caught that truck convoy flat-footed near Myitkyina last week. They say that the Japs had to bring up eight additional trucks to carry away the casualties when the smoke cleared." Sussky, a beetled-browed youngster who joined the Air Force after his graduation from Arkansas Tech in 1940, hung up the phone and turned to the other Dragons. "We got some more work this afternoon, fellows," he said. "A patrol mission over near Taungzup to look for troop movements and truck convoys. Carry the same load as this morning." He pointed to Lt. Bob Bixby of Helena, Mont., and Lt. Don P. Taylor of Los Angeles, Calif. "Everybody goes but you two," he added. "You fly cover for the transport that drops food for those Kachin troops in the hills." "Will we get back in time to see 'Wake Island' over at headquarters tonight?" Irwin asked. "Think so," Sussky said. "Just to make sure, phone and ask them to hold it up until we get back. I want to see that picture myself." A few minutes later the dragon-nosed planes lifted their tails and headed again toward the mountains on the Burma border. The Yanks were off with their Assam Dragon. There is no connection between the reading and the sound of that last sentence. If you don't believe it, ask the Japs. SGT. FLOYD ELLISON (left), mechanic, and Pvt. Harry Moran, machinist, get one of squadron's P-4Os ready.